No. Seven is a bold brush style script family of three weights, ornament set and a block capital “small caps” font. No. 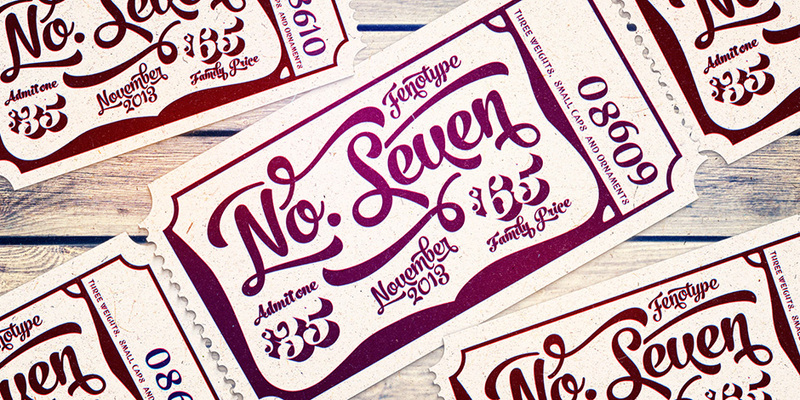 Seven is equipped with plenty of OpenType features. To activate the alternates, click on Swash, Contextual, Stylistic or Titling Alternates or Discretionary Ligatures, Tabular or OldStyle Lining in any OpenType savvy program or manually select the characters from the Glyph Palette. Always keep the Standard Ligatures on for the best outcome. No. Seven is an effective font for creating ambitious headlines, logos & posters with a custom-made feel. File size is approx 244.1KB (348KB unzipped), offered as a single download. Thank you so much for your comment and I am so sorry that you are having trouble with this!